As the year moves through the summer it enters into the mellow meandering glow of autumn, a season that is characterized by pleasant balmy weather, falling leaves and a beautiful aroma in the air. This a time for picnics and moving out into the wild and be in tune with nature. You could go out on long walks with your beloved and trek through woods with your friends without bothering about the sun beating down on you. However if you are busy at work and cannot go out to enjoy the autumn weather, you can always soak in its beauty right through your computer screen by installing the delightful Autumn Time 3D Screensaver 1.01.3. It offers you a great autumn ambiance set in a pristine forest where you get to hear the chirping of the birds and droplets of rain falling on the ground. While typical screensavers that depict Autumn tend to depict the latter half of Autumn when leaves are falling and at times even paint a gloomy tone, the Autumn Time 3D Screensaver 1.01.3 is quite the opposite. It depicts early autumn when the leaves are still on the tree and birds are making their way to warmer climes. 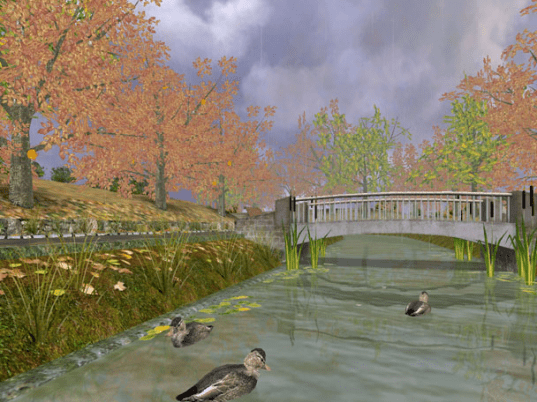 The ambiance is pleasant and you can view ducks lazing around in the ponds. Beauty is all across and even the soft background music creates a spell on the viewer. As rain comes down in soft drizzles and birds fly by your screen, you will find yourself transported to an entirely different world where your sense can be at peace. The Autumn Time 3D Screensaver 1.01.3 is invariably a great way to sooth your senses in midst of a grinding work session on your system. For its overall aesthetical beauty and helping you absorb the essence of autumn, this enchanting screensaver earns a score of 3 rating stars.